We are writing to express my strong opposition to the proposed plan to redistrict parts of West Newton out of the Peirce and Newton North district. Redistricting plans should not move children from walkable to non-walkable schools. We live just 0.7 miles from the entrance of Newton North high school, a distance so close to Newton North that we do not even qualify for bus service. Our close proximity to Newton North is further illustrated by the fact that our polling location is at the Newton Senior Center at 345 Walnut Street, just down the street from Newton North. My older son Kristian is a recent graduate and my daughter Madeleine is a current student at Newton North High School. As did my older son, my daughter walks to and from school frequently and is very glad for the independence and exercise that comes with taking the first and last 10 minutes of her school day walking. Further, as their parents, we like that our children have a set time each day to relax, get some fresh air, and reflect during their walks to and from school. We believe that these walks help to reinforce habits that we try to instill in our children, namely that of physical activity, energy conservation, and stress reduction – each of which have been shown in scientific studies to promote a healthy lifestyle. These “life” benefits are accompanied by an important practical benefit in that the children are able to go to school and come home from school on their own, making our life as a two parent working family much easier. increased stress and reduced physical activity, where instead of walking outside for 10 minutes each way, my son would sit on a polluted bus for 30-40 minutes each way. We moved to our home so that our kids could walk to school – to the Peirce School as elementary students and to Newton North as high school students. 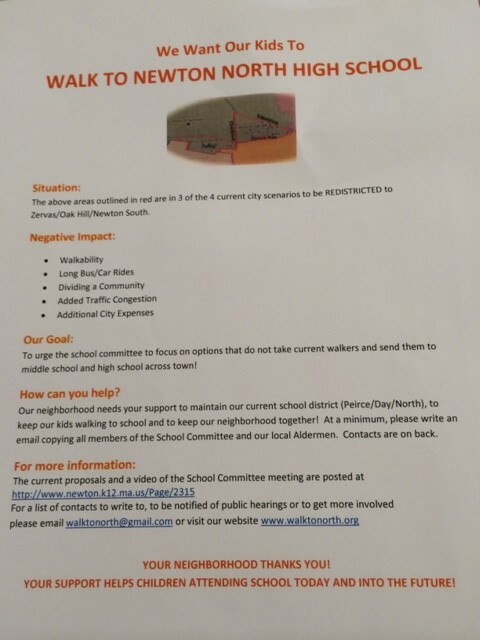 If redistricting is about what makes sense for the elementary schools, please note that in addition to their walking to Newton North, we also frequently walked our kids to Peirce during their elementary years (10 years). Walking our kids to school is a special benefit of living in Newton, helping to instill lifelong healthy habits in our children and helping to create a close-knit community. This is in large what makes Newton such an incredible place to live. Eliminating our walking schools and sense of community is harmful to our children, to our family, to our neighborhood, and to Newton. We are strongly opposed to redistricting, and we will be vocal and active in our opposition. Please do the right thing and leave us where we are.